The Broncos' owner since he bought the team from Edgar Kaiser Jr. in 1984, Pat Bowlen is a finalist for election into the Pro Football Hall of Fame after he was nominated this summer as a contributor finalist. KUSA — It was perhaps her coming out moment. 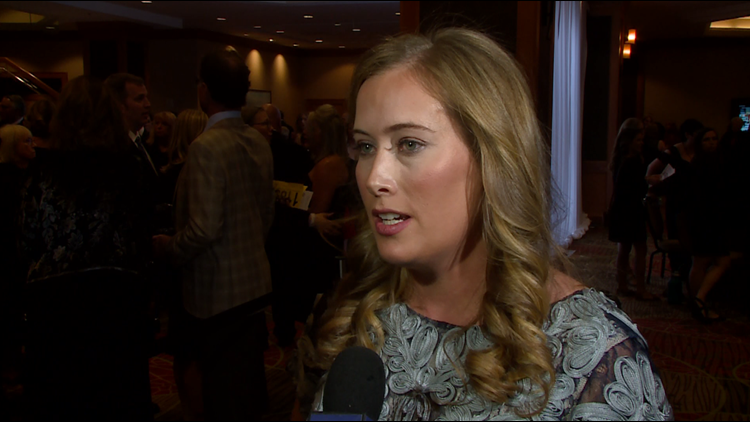 Brittany Bowlen exuded dignity and humility as she raised up her father while stating her goal of one day running the Denver Broncos, and also honored the intentions of the Pat Bowlen Trust as she downplayed the notion of a potential rivalry with her half-sister Beth Bowlen Wallace. It’s the type of response a CEO would make, which Brittany, 28, has a chance of one day becoming. Participating along with several Bronco players at the annual Global Down Syndrome Foundation’s fashion show, Brittany was asked specifically about becoming the Broncos’ controlling owner. The team announced in 2014 that Pat Bowlen had been diagnosed with Alzheimer’s disease. The Broncos’ owner since he bought the team from Edgar Kaiser Jr. in 1984, Pat Bowlen is a finalist for election into the Pro Football Hall of Fame after he was nominated this summer as a contributor finalist. In the late-1990s, Pat Bowlen set up his trust that stated he’d like one of his seven children succeed him as the Broncos’ controlling owner providing they earned the position. Brittany Bowlen received her bachelor’s degree in finance with a 3.8 grade-point average from Notre Dame, and more recently she received her Master’s and Business Administration (MBA) degree from the Fuqua School of Business at Duke. She has served internships with NBC Sports and the NFL and is currently working at McKinsey & Company, a global marketing consulting firm, in downtown Denver. It was Brittany’s two-year stint in the league office in New York in which she worked six months each in four different departments that she seemingly became the frontrunner among Pat Bowlen’s seven children to one day run the Broncos. Joe Ellis, the Broncos’ current chief executive officer and president, followed a similar program. Brittany Bowlen was asked about her half-sister having similar aspirations of running the Broncos.